I’m not going to grouse about how it still feels like fall early spring in Seattle, and how it rained this weekend. Instead, I will tell you about our latest treat in the freezer, that I can’t seem to make enough of. This is one of the best summer treats I can think of to make at home. So easy – you must give it a try if you like bananas – in the slightest bit. I didn’t experience my first chocolate coated banana until I was in my 20’s, on a break from biking around Martha’s Vineyard, a beautiful island off the New England coast. I stopped at a local grocery store and noted this unique treat among all the ice cream pops and cups. I couldn’t imagine why this frosty treat was not an option on the ice cream truck menu – my greatest exposure to quick, cold treats on a hot, sunny day. It seemed like it fit right in with strawberry shortcake ice cream bars and fudge popsicles. In this recipe, I offer you two kinds of coatings: chocolate, and vanilla – a dairy-free, SCD version of vanilla using cashew cream. To make a white chocolate dipped banana, just replace the chocolate chips in the chocolate coating recipe with white chocolate chips. And the recipe that inspired me is here. If you love vegan, veggie, yoga, and peace, you will love this blog (as I do). I recommend reading the “About” for some poetic guidance for the day. Nina uses raw cacao paste in her recipe, which I haven’t found yet. I tried to make the paste with my raw cacao nibs, with disastrous results, and ran out of patience and nibs, so I’ll try again another time. Combine all the ingredients, except the coconut oil, into a high-speed blender and blend until creamy and there is no trace of nuts (it can take a few minutes). Now add the resulting cashew cream to a bowl and place it over hot, simmering water. Add the coconut oil, and stir until completely melted. Cool for a bit and dip the bananas in it before freezing them again for at least 5 minutes. Store in the freezer, covered. Peel the bananas and slice each of them in half. Slide a popsicle stick in each half, about halfway through, and then freeze them for a few hours (covered). Make the chocolate coating by melting all the ingredients for that coating in a bowl over hot water (a bain-marie). Let the coating cool for a bit and then dip each banana in the coating, swirling it around to coat it evenly. Optionally, dip the coated banana in chopped nuts and then place it on parchment paper (or other non-stick surface) in the freezer for at least 5 minutes (and store in the freezer, covered). My favorite! 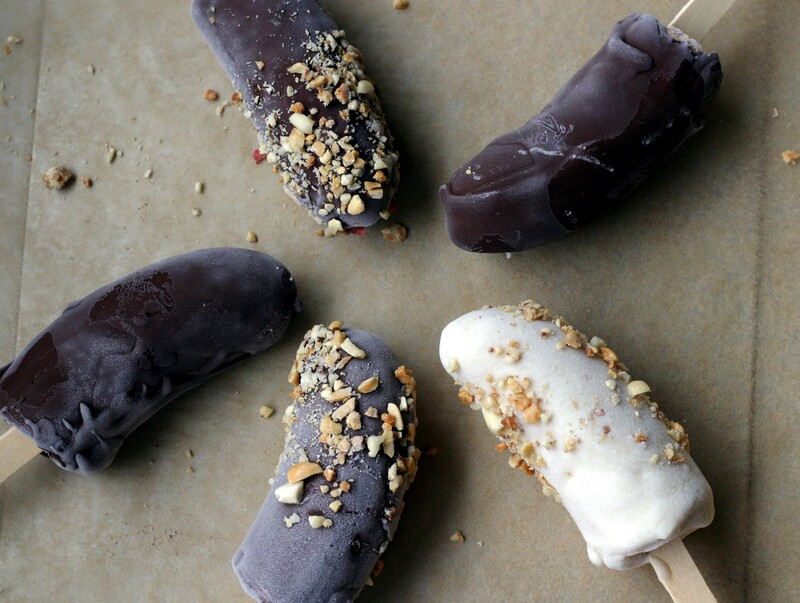 I’ve only done chocolate banana pops, I’ll have to try the vanilla. Thx for sharing. These look DELISH! 🙂 What a fun treat for us SCDers out there! Thanks!! Your welcome Allie! Just read your bio – my son is a red head as well – very special place in my heart for red-heads 🙂 Be well. Oh really? How magical!! 🙂 I love seeing other red-heads. It makes me smile, there’s always a special connection! Thank you, Erica. I’m on the road to wellness & so far, it’s been a success!! Thanks for all your SCD recipes! Sounds like a wonderful easy but delicious snack. I believe almonds may compliment quite well with the chocolate and bananas. You continue to delight with you innovative recipes for all us SCD-ers. Thanks for all your generosity and sharing. My first ever frozen banana was at Disneyland when I was about 8. Since the temperature here in CA is hitting close to 100 this recipe is in perfect timing. Have never seen a vanilla or white chocolate version. May have to try those first. I guess you store these frozen b/c the recipe is for “frozen” bananas. I’d like to try the coating for low carb cake pops — will the coating hold up (stay hardened) at room temp? It might not – the reason it sticks so well is that it freezes on contact with the frozen bananas. Thank you! I used to get frozen bananas when I visited the San Diego Zoo on vacation as a kid. I looked forward to getting one when I was there. I’m going to really enjoy these. Do you think I could use cocoa butter instead of coconut oil in the vanilla version to make them chocolate and also SCD legal?